Its lovely and hot over here... no runs yet, but plenty of stretches!!!! No pints either, though I was given something after one of our meals that tasted lemony and slightly vodka-y so the jury is still out on whether it was a drink-drink or not!!! D and I are heading to the Eternal City of Rome tomorrow for a 5 day break. While there, I will run around the Vatican in a big bishop's hat, run down around the Colosseum dressed like a Roman soldier and run up and down the Spanish Steps dressed like Pedro Delgado. Well, I might get one run in... fancy dress optional. I ran a 3 miler yesterday evening - my first run since the torturous sick boy run of Craughwell 8 days earlier... I'm just glad to be back at it but found the third mile tough enough. I should have run outside but the warmth of the house won me over so I just hopped on the treadmill for a slow 9.15 pace run. Happy to be back and hope the sluggishness passes with the next run! 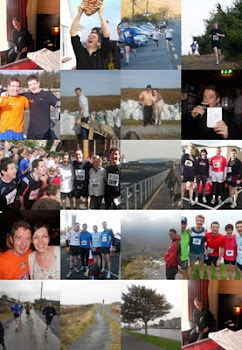 My next big race is the Connemara Half Marathon, on April 11th. From what I have heard this is a tough old run with much of it going upwards. It wouldn't be too dissimilar in terrain to my own home run of Seanféistín but it is apparently tougher. I have still not run since last Sunday's Craughwell 10 miler, but I will go for a trot this weekend and start my training proper from next week. According to www.mcmillanrunning.com I should be aiming for a time of 1hr 53... My best half was last year's 1.56 (Galway Half Marathon) so I don't think it is too optimistic to take 3mins off that - the only big 'if' is the toughness of the course. Paddy's Day and No Drink... a disgrace to the nation. A beautiful St. Patrick's Day in Galway with floats galore, pipe bands from Scotland and Brittany, the Corrib dyed green and all the other leprechaunic stuff of myth and legend but not a sup of drink this year... what would my old self say? Long gone are the days when we drank Guinness by the bucket load (like last year) and made mules of ourselves in the name of the patron saint... No run since Sunday (getting rid of the bit of unwellness), but am feeling decent enough to start the assault on the Connemarathon (half marthon) for April 11. PS: Fáilte roimh CMCI ar an saol ó inné. Craughwell, Crocked and not so well. 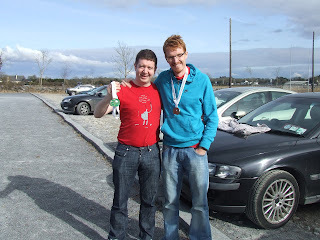 There I am with Rónán, showing off our medals. Craughwell 10 miler completed in 1hr 29mins... a full four minutes slower than the original aim, but I have an excuse... I swear. I know that it is up there with 'the cat ate my homework', but I was genuinely sick (unwell at least) for this race and ran with aching bones ( love the word 'aching', it adds drama). The day didn't start too well for me - I had car troubles - which was the last thing I needed as I was up in the Wee county with my wife and her family and it would take the guts of 3hrs to get down. However, thanks to the generousity of her folks I got going and made it in good time. I met Rónán in Craughwell and we stood side by side at the starting line... which was the last I saw of him until the end (he posted a fantastic time of 1.08). Throughout the run my legs were hard to move and mentally I didn't want to be there. However, this being the year of 'no quitting' I just decided to put one foot in front of the other and keep going. At one point I tried to raise the pace but soon stopped that carry-on when I felt a vomitous surge! So I kept going...plodding along and being constantly passed out! The course was lovely and flat and the day was perfect for running, so I was a bit disappointed at not being 100%, as this was the day to go for a personal best alright, but at the same time I felt a strange kind of satisfaction at just battling along against my internal organs. There were times when I feared I would be 'bum last' but thankfully there were enough fun joggers and walkers to give me a cushion. I didn't have any watch so I was sure my pace would be in the 11mins but in actual fact it was 8.54 - which in a weird way means that this run gives me more encouragement than ever about breaking a sub 4hour marathon! I didn't go for a pint - so I reckon I'll save these for the Easter break! I'm off to County Louth this weekend to visit the in-laws and will be travelling down the motorway on Sunday morning for my Craughwell race. I have not run at all this week... just didn't feel great, so from one day to the next I kept putting runs off in the hope that I'd feel better the following day... it leaves me now with the prospect of either going for a run tomorrow (I will be travelling today) or just leaving it until race day. Rónán reckons I might be better off after having a week's rest, and I'm willing to; A) Believe him and B) Blame him if things go pear-shaped on Sunday. 1) I am too laid back to be pessimistic. 2) I am still long enough away from the marathon date to improve my time. 3) The target time is based on the time I ran in Tuam, which was a one-off, short, speed run as opposed to being based on a longer run and along normal 'form lines'. Preparation this week has not been great; I ran an 8 miler on Sunday last and found that heavy going and the rest of the week has been runless so far ( I am workng late tonight so will probably only run tomorrow). Now with all those excuses put out there I will finish this negative blog posting on a high note... if I run Craughwell in 1hr 25mins then that will be the fastest long run ever from the 24pintsman. The picture is of Raftery's Bar in Craughwell, where I can technically have my third pint of the year, according to my drinks schedule... however, I am debating whether I should have it there, or leave it until St. Patrick's Day, or to even Easter time??? Tough 8 miles out Seanféistín...having spent yesterday digging the garden was no help to me today. My back was a bit sore and my legs were very heavy so it was painful from the word go. A slow enough pace too - around 9 minute miles. Still, it's the last big run before Craughwell next week so I'm happy just to have finished it. It shows one thing for certain - you should'nt dig up the garden before running 8 miles in Seanféistín. No hoax here - I am out and at the garden and Spring is definitely in the air (it is even warmish outside!)... The aim is to do an 8 miler tomorrow or Sunday that will set me up nicely for the Craughwell 10 miler next week. Hopefully my back won't give up on me following this stint in the garden! God that was freezing cold but I, being the incredibly brave soul that I am, simply took a deep breath and ran straight in. Temperature outside was around 2 degrees so the sea was definitely at freezing point! On the way in I saw a jellyfish and could have sworn that it was looking at me with a bewildered eye saying 'what in the name of God would bring you in here on a cold day like this'. But in I went, down I went and I swam for a solid twenty minutes, up and down the bay, rescuing lobsters from pots, saving fish from seagulls and generally being a man from Atlantis. Can the Snail Break 4 Hour Marathon? I did a four mile run this evening, treadmill job but at a decent pace for me (8.30 on the treadmill is decent for me). I am definitely going for the Dublin City Marathon this year... I have already completed two marathons but they were slow enough (4hr38 for New York and Berlin in just over 5hours)... I also crossed the finish line in Florence (and not far off the elite athletes either) but truth being told I cheated that result...no, I'm not proud of it, but they should have known that a slightly fat and gingery haired Irish man was not up there with the Kenyans by playing fairly. Anyway, after a few days of not feeling the best, I am now back to running. Immediate challenge is Craughwell, but I am turning my thoughts to training for the Dublin City Marathon... an 18 week programme should start in the Summer, with a possible record breaking marathon in the Autumn. It can be done...!